This is not the first time we've auditioned Eclipse's speakers, but there have been changes made to the system, in particular the TD712 main/satellite speaker, which demand a new look. Plus, this the first time that a complete 5.1 channel system based on the latest and greatest models in the range have all been available in one place at one time. And let's not forget that the Eclipse proposition is unique – a much misused word, but completely justified in this case. Eclipse is a small autonomous group in the much larger Fujitsu Ten organisation, which is dedicated to the ideas underlying the Eclipse TD series. It is a labour of love, committed to a completely different way of designing speakers. Where traditional loudspeakers are intended primarily to maximise frequency response and power handling and to minimise harmonic distortion, the Eclipse (Time Domain) range is predicated on speed and timing. The mainstay of the system is the TD712, which in its current guise is known as the TD712z MK2, and which is available in silver or black finishes, the latter of which is probably the more popular of the two, because it blends in with typical domestic surroundings. The TD712 is available with a complex matching pedestal stand, which enables the speaker to be lined up to suit the listening room and seating position. The stand is available with two column heights, one appropriate for the main and surround speakers, placing them at head height when seated, while the alternative support has the same design features, but a much shorter column. This is designed primarily for the centre speaker in an installation where it is, typically, placed below a projection screen, although it would also be equally suitable for use below a wall-mounted TV. The final component in the system is the TD725sw subwoofer, which looks superficially fairly conventional. This system is a classic example of form following function. Time Domain is the reason the satellites look as they do, with a complex egg-shaped enclosure made from ABS, which houses a single 4.75-inch fibreglass cone driver unit that slightly disingenuously is described as full range (it isn't, but it gets surprisingly close). Intrinsic to the design is that there is no crossover, with all the phase and integration problems that those networks entail. The reason for eschewing multiple driver units is to avoid multiple non-coincident sound sources, and to ensure that all frequencies are radiated without audible time delay. The enclosure flows smoothly around the driver, which escapes most of the usual secondary sound radiation (diffraction), and the shape of the enclosure is also designed to eliminate as much resonant behaviour as possible. Internally, the enclosure is designed to feed reaction forces away from the it (where they would end up being audible after a short but inevitable delay), and down through the supports, dissipating the unwanted energy into the floor. There has been considerable development of the TD712 speakers over the years, and the current model has a 50 per cent larger internal cavity, plus a broader frequency response at both ends of the audio frequency band. Although the TD712 only has a single drive unit, Eclipse has not been able to produce deep bass from the same speaker, so this task is delegated to a subwoofer, but this is not a significant disadvantage as low frequencies can be made to meld naturally with the output of the main satellite. The rather blunt design of the sub is nothing like as interesting as the TD712. It looks like a large, rectangular box, but it shares much of the same thinking, using two 10-inch ultra-fast drive units working in opposition (ie back to back) with an aluminium rod bracing the two against each other. This helps cancel out most of the unwanted energy, and the drivers are also decoupled from the main structure. A powerful 500W Class D amplifier keeps it all humming. The system was tested in two distinct ways: firstly as a 5.1-channel home cinema array, using a high-end Denon Blu-ray player and Onkyo receiver, and then as a 2.1-channel stereo music system with an audiophile combination of a Denon CD/SACD player and stereo amplifier. In just about every way possible, it was remarkable successful in both generic applications, even though there are inevitable caveats. As a multichannel home cinema system it can, of course, be augmented by additional satellites, or with extra subwoofers, although in the latter case, the potential benefits are bass uniformity and maximum output level at the lowest frequencies, rather than to bass depth. Some remarkable sonic features were obvious with stereo and multichannel use. First and foremost, the level of detail is very high, with the sound presented coherently and with exceptional spatial imagery and focus. The bass from the subwoofer is deep and pure, and if set up with care, melds beautifully with the satellites. Even with prior experience with Eclipse, I was surprised by how good a job it made with difficult music in 2.1 mode; big Mahler symphonies breathed fire and menace and were completely gripping. And the same applied to other types of music such as Mary Coughlan's jazzy Moon Over Bourbon Street, as well as classical orchestral and piano-accompanied soprano voice. But, of course, the primary focus for this test was multi-channel home cinema, and it is true to say that this system would not be my first choice for one of the Terminator epics or Kill Bill, which are better served by more conventional systems. But I was more than impressed by slightly lower octane material where clarity, image focus and atmosphere are the order of the day, as exemplified by the lossless soundtrack in Earth, and mainstream but carefully engineered films such as Lost in Translation or Pleasantville, to name just two examples picked at random. These simply sounded natural, with pinpoint imaging and a deal of depth. On such material the overcooked, over-dramatised quality that many systems brings to the party is not only unnecessary, it is potentially an active hindrance. In musical terms this Eclipse system is superbly communicative and expressive, and ultimately it tells you more about the performer's intentions than almost any other, treating source material with the utmost respect. The same applies to 5.1 film soundtracks, although if you want earth-moving bass and enough output to shake the rafters, you might want to look elsewhere. 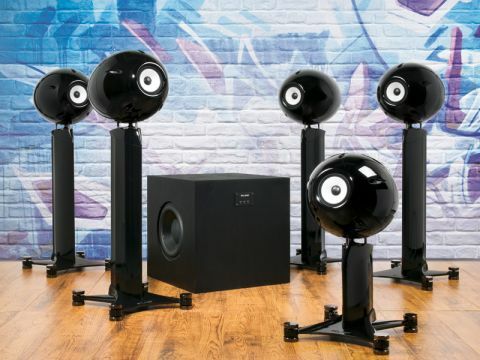 Of course, £16,000 is a lot to shell out for a 5.1 array, but in terms of design, build-quality and pure audio performance, the Eclipse system has few peers.